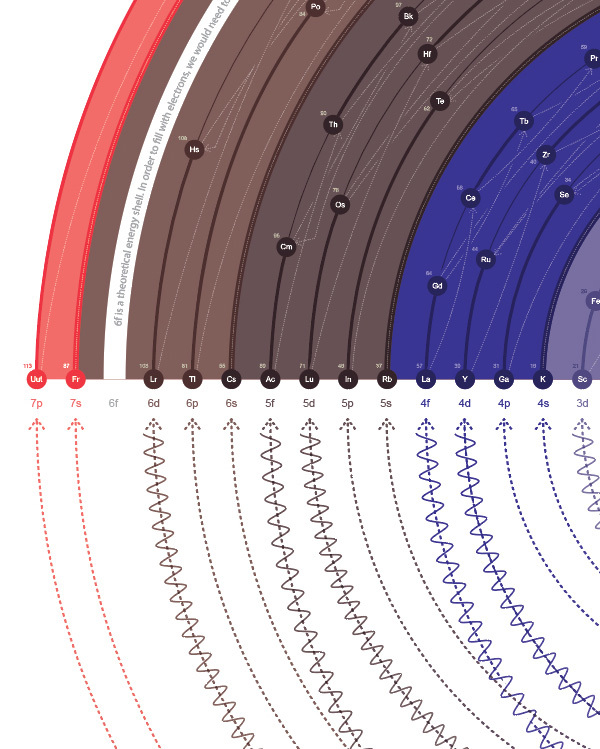 I worked on this poster for 2 months, visualizing the electron fill order of every element on the periodic table. I’m always excited for the design challenges I undertake, but none more so than this. My goal was primarily to visualize 3 things: 1) Electron pairs 2) Electron fill order of the Aufbau Principle and 3) the phenomenon of lower numbered shells filling AFTER higher numbered shells (also part of Aufbau). All in all, I’m very pleased with outcome and think Niels Bohr summed it up perfectly by stating “When it comes to atoms, language can only be used as in poetry.” The only thing I was unable to visualize (which I tried very hard to do) was incorporating the atomic theory of each energy shell’s 3 dimensional shape. Perhaps with more thought, and better understanding, I can one day incorporate this. This particular version highlights the various energy levels. I designed a similar, but different version, that highlights the individual elements.